Belgian town of Bruges – is a home land of the famous lace. 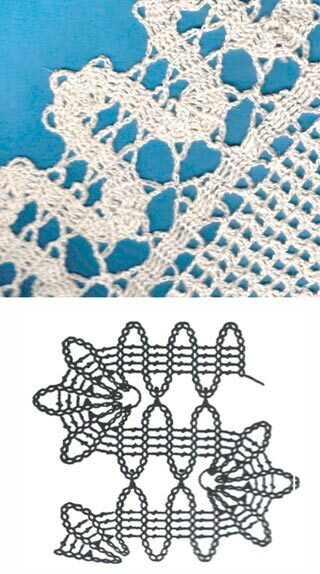 Bruges' crocheted lace imitates lace, which is done on the bobbins, - it's a special kind of decorative crochet. 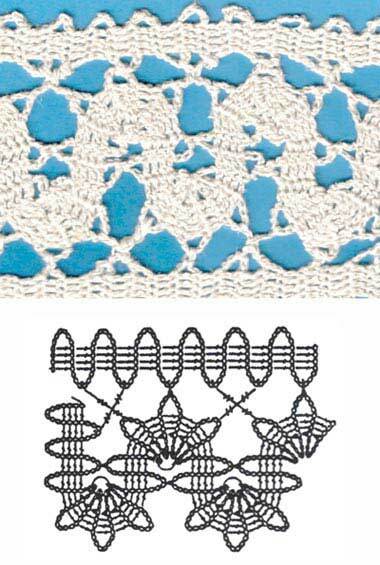 Though this lace mostly serves as decoration for the curtains, table-cloth and pillows – it a true lace! In the true sense of the word, because this filigree hand technique has always been a symbol of the precious Flemish laces, which were done on the bobbins. Bruges' lace consists of the ribbons which form beautiful ornaments. 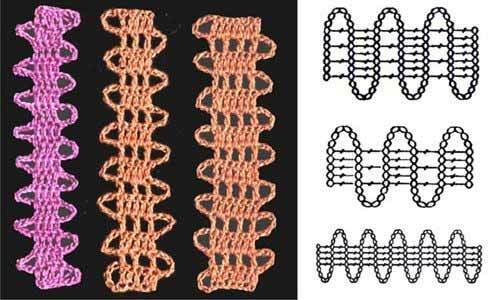 These ribbons are united when crocheting by small chains out of the chain stitches, and they are decorated by the chains so that an exact copy of the bobbin laces is done. Bruges' lace was famous in the 16 th century already. Western Flandria belonged to the Netherlands at the time – a blossoming, rich country during the reign of Phillip II, which had become the center of the Spanish Empire. Trade and colonies were bringing big incomes for the country, thanks to which the arts had flourished. First of all they appreciated the skill to dress smart. At the time there were about 1500 kinds of the lace trimming from silver, gold, and silk. They were probably also made on the bobbins, though the technique with the bobbins was created not in the Netherlands. Not a single original sample had been registered in this region. Such works of art mostly have Venetian origin. But either way, it's obvious that making the lace on the bobbins was considered to be national art in Flandria. In the middle of the 17 th century there appeared laces with the flower, plant motives and with the images of vases. The smartly made ribbons, which consist of the crochets with one or several brides, unite with each other. 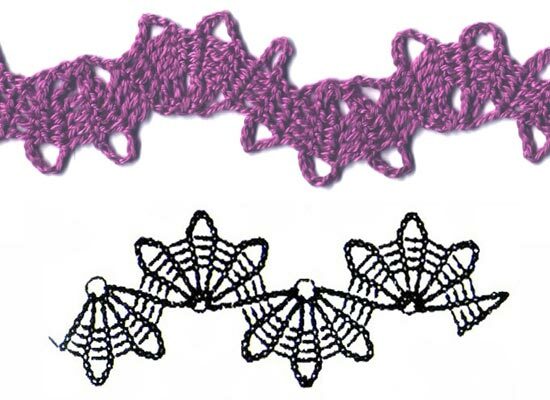 The ribbon for the crocheted lace is done by straight and reverse rounds, in the beginning of each of them you need to make next chain stitches. As a result elegant crocheted laces are formed, which bring a unique charm to the napkins and clothes. It's not hard to crochet the ribbon, but you should study the consequence of crocheting the ribbon using the pattern before you proceed. 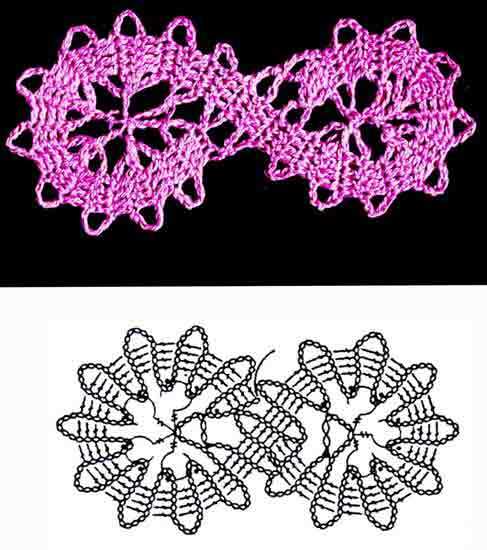 There are a lot of variants of how to crochet the ribbon, the most simple of them are shown at the picture. Pic.1. 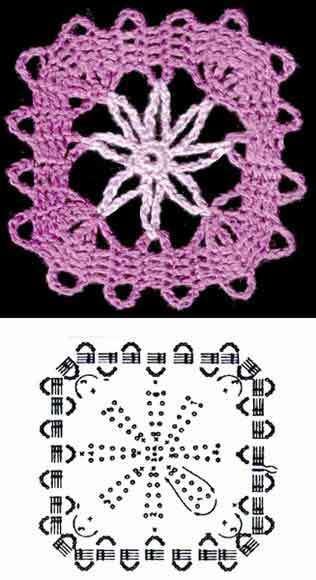 The pattern of the ribbon for the Bruges' crocheted lace. 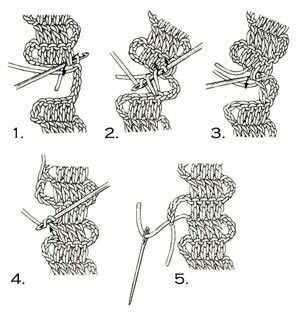 First, they usually make a ribbon of the certain length to create a crocheted lace, and then the crocheted ribbon is united with each other into the ornament in the process of its further making using the pattern by the single crochets or the half double crochets. The spaces are filled with the chains out of the stitches when you crochet the lace or after the entire ornament is ready. 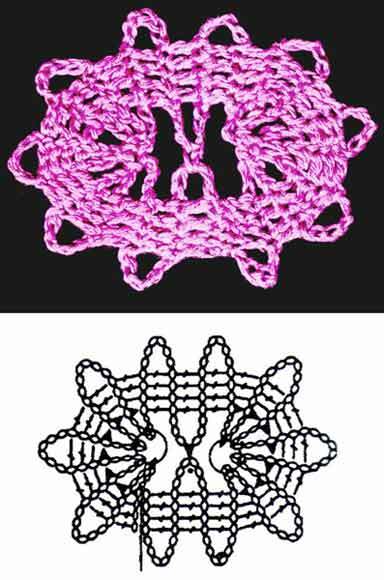 At the picture here is an example of how to crochet a complex joint between the neighboring fragments of the ribbon in the ornament. Pic.2. Making a joint between the fragments of the Bruges' crocheted lace. 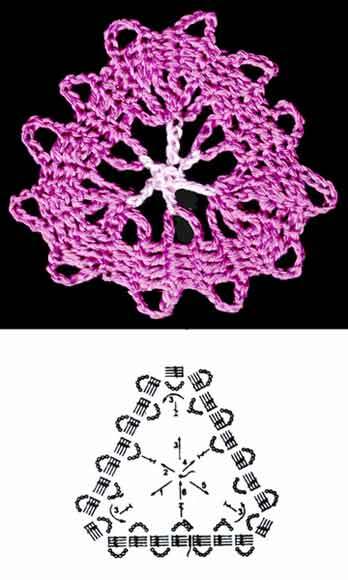 You can make the crocheted lace entirely by the ornaments out of the ribbon or you can combine them with small pictures of the open-work or compact crocheting, you can bring in flower motives, rhombs, squares as the joining elements. It's ought to crochet through several chains together at any turn of the ribbon in the crocheted lace. 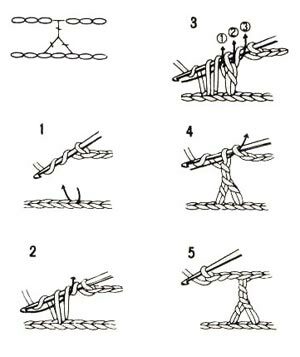 To do so crochet the necessary amount of chains and the half of the last chain, then thread the loop through the previous chains and crochet them together. 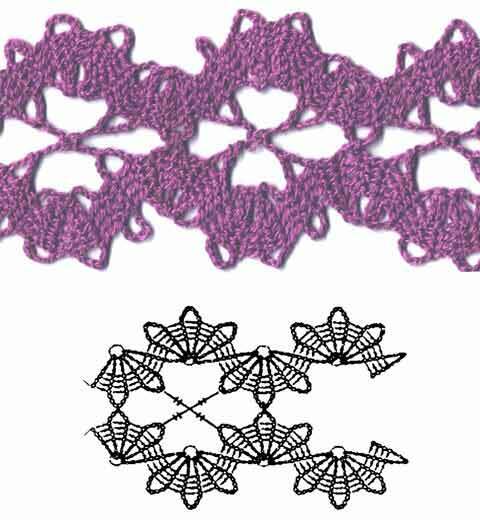 To avoid the formation of the hardenings at the bends of the ribbon in the crocheted lace, you can make a half double crochet at the internal side of the bend, and a double crochet at the external side of the bend. 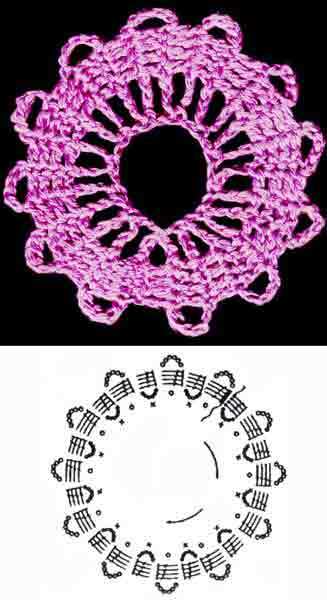 To unite the ribbon into a semi-circle or a circle, crochet the ribbon of the necessary length and join it using the following picture. Pic.3. 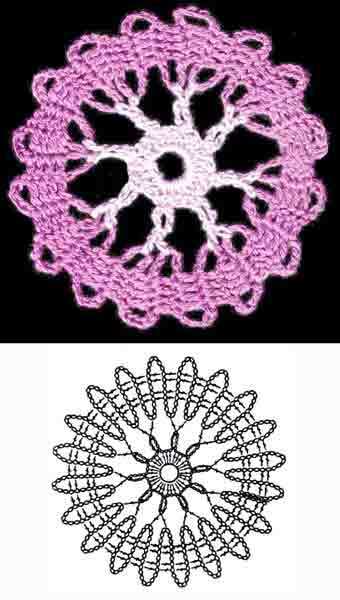 Uniting the ribbon when making a circle in the crocheted lace. 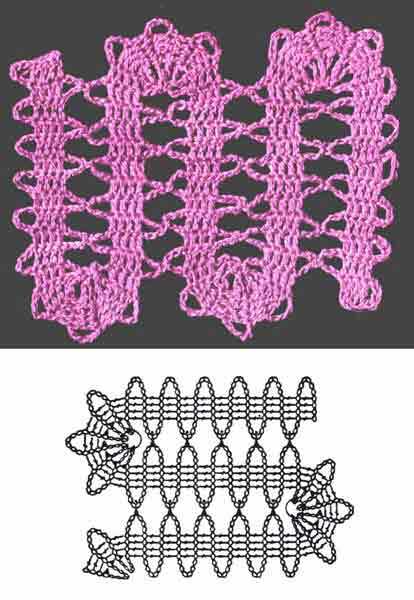 You can study the technique of making the crocheted laces using the examples of the following most often repeated elements. Pic.4. The fragments of the Bruges' crocheted lace. When you crochet the lace out of the ribbon, the basis for imagination is the most favourable: you can reach the variety not only by the picture, on which the ribbon is laid, - the harder element of the lace, but by different kinds of the ribbon itself. 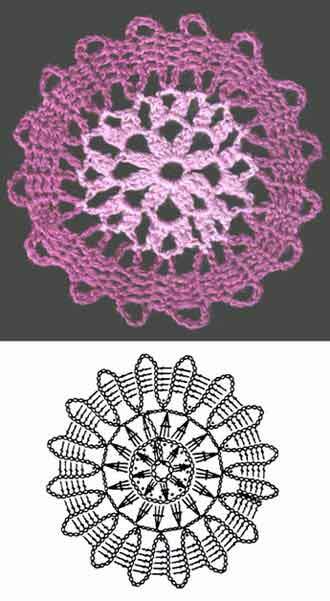 The contrast of the picture is usual for all kinds of the crocheted lace. You can follow the ornament easily having understood the main regularities of crocheting the lace out of the tapes and having gained the necessary skill. If you repeat it in the different rhythm with the differe nt orientation, it will enable you to create the unlimited variety of pictures.